Last week, the daily newspaper al-Shorouk reported that important figures in Egypt's ruling National Democratic Party (N.D.P.) are meeting to decide the name of the party's 2011 presidential candidate. The article didn't cite any sources, and the N.D.P. issued a flood of statements denying the occurrence of such a meeting. However, the rumor has caused the issue of succession in Egypt to resurface. It doesn't matter how hard the N.D.P. denies the speculation and conjecture, it is going to have to name a candidate in the near future. Although President Hosni Mubarak's son, Gamal, managed to make a quiet, backroom entry into the political scene, his emergence as the N.D.P. 's next candidate is clear. He gives major speeches, tours poor villages and has a say in all the economic, social and political issues. 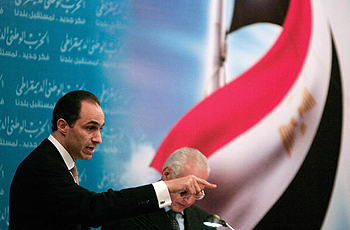 As Egypt has always been run as a one-man show, the elite usually reflect the ruler's ideology, identity and beliefs. Egypt's economic, political and social trends indicate that Gamal Mubarak already has a wide breadth of influence. The rise of Gamal Mubarak started in 2002 when he was appointed head of the policy committee in the ruling N.D.P. Two years later, a new cabinet was appointed, headed by the Western-educated technocrat Dr. Ahmed Nazif. Vital ministries were given to unfamiliar young neo-liberalist faces who spoke perfect English, were roughly Gamal Mubarak’s age and received some, if not all, of their education in the West. This cabal is currently known in Egypt as the "businessmen's cabinet." Gamal Mubarak did both his undergraduate and graduate studies in business at the American University in Cairo. After graduation, he had a successful career as a banker in the Bank of America branches in Cairo and London, becoming one of its top executives. Upon his return to Egypt, he established the Future Generation Foundation, an N.G.O. aiming to teach modern skills to college students and young graduates. His joining of the N.D.P. was accompanied by a huge makeover and re-branding of the ruling party with a "new thought" slogan. Egypt has also been aggressively moving towards a free market approach where the government's performance is measured by how much foreign direct investment enters the country and how well the stock exchange is performing. Looking back over Egypt's timeline, one can trace how social and economic trends bent in this new direction, and how Gamal Mubarak found a place in the middle of the curve. In the era of social division in pre-revolutionary royal Egypt, it was the aristocratic class that ruled the nation, and pashas were the cream of the crop. All the important ministers, political figures and even businessmen held the prestigious title pasha. In 1952, Egypt experienced a revolution, or better said, a military coup. Since it was carried out by the military, generals and colonels replaced pashas as the new power. This remained the case until the rise of Islamic extremists and the assassination of Egypt's former president Anwar Sadat. After the death of Sadat, Egypt declared a state of emergency, and emergency law has been applied ever since. This gave power to a new elite: the police. For almost three decades, leading up to the mid-1990's, emergency law turned Egypt into a police state, with the police holding tight to the enormous power they gained during their fight against Islamic extremism. Now, a transitional period is in place and the trend is changing again. The youth who used to aspire to become military and then police officers are now fighting for a place in the many multinational corporations, banks and I.T. companies opening their doors every day in Egypt. Studying economics or business administration in one of the new Western educational institutes has become the latest method of securing at least an upper-middle-class social position. Over the past six years, Canadian, German and British universities have opened their doors to students keen on making it into the corporate world. Forty-story, Shanghai-style office towers are now being built everywhere along the Nile. The dream for a growing number of young Egyptians is getting a job in a multinational bank headquartered in one of these towers. All of this is the influence of Gamal Mubarak's neo-liberal and Westernized personality. Whether Gamal Mubarak will be the next president of Egypt is being hotly debated in Egypt. But a quick look at the timeline of Egypt's new trends, when viewed alongside Gamal Mubarak’s C.V., indicates that Gamal Mubarak is already the current ruler of Egypt, despite not holding the official title of president just yet.